We’d love your help. Let us know what’s wrong with this preview of Empty Bodies Box Set by Zach Bohannon. 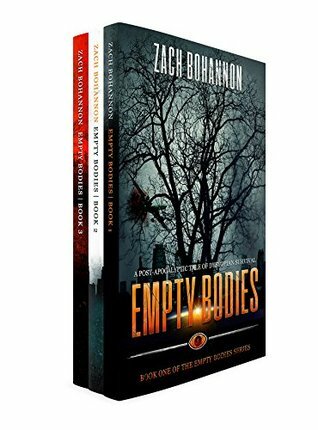 The first three books in the best-selling Empty Bodies series! Hundreds of thousands of people suddenly collapse, leaving their friends and loved ones behind, terrified and confused. Moments later, the fallen rise, and the survivors become the hunted. Empty The first three books in the best-selling Empty Bodies series! Empty Bodies follows three people with one simple objective: survive. To ask other readers questions about Empty Bodies Box Set, please sign up. I love this author and got so involved with the characters that when these three books were done I went looking for the audio version of the next three in the series. I listened to these books in only about three days. I have an Audible membership so will get the next three. This is about people faced with survival in a world with a virus that some people got and it makes them into hungry aggressive empty bodies. Zombies, yes. I like the voice of the boy who is left alone and found by a man who h I love this author and got so involved with the characters that when these three books were done I went looking for the audio version of the next three in the series. I like the voice of the boy who is left alone and found by a man who has lost his family too. The boy stays with him for safety but has a mind of his own when things turn bad for them. I really wanted to like this series. It was entertaining enough, despite the cliches, despite the number of convenient coincidences, and despite how derivative it is. Then came the end of book 3. I won't mention what happens, but it moved this from "an entertaining read" to "are you f*****g serious?!?" I wouldn't say don't read it (it's not THAT bad), but you should definitely lower your expectations. Great trio of novels, very enjoyable. Definitely will read the next one in the series at some point. Highly recommended. Something about the dark side of life has always appealed to me. Whether I experience it through reading and watching horror, or listening to my favorite heavy metal bands, I have been forever fascinated with the shadow of human emotion. While in my 20's, I discovered my passion to create through playing drums in two heavy metal bands: Kerygma and Twelve Winters. While playing in Twelve Winters (a Something about the dark side of life has always appealed to me. Whether I experience it through reading and watching horror, or listening to my favorite heavy metal bands, I have been forever fascinated with the shadow of human emotion. While in my 20's, I discovered my passion to create through playing drums in two heavy metal bands: Kerygma and Twelve Winters. While playing in Twelve Winters (a power metal band with a thrash edge fronted by my now wife Kathryn), I was able to indulge myself in my love of writing by penning the lyrics for all our music. My love of telling a story started here as many of the songs became connected to the same concept and characters in one way or another. Now in my 30's, my creative passion is being passed to willing readers through the art of stories. While I have a particular fascination for real life scenarios, I also love dark fantasy. So, you'll find a little bit of everything in my stories from zombies to serial killers, angels and demons to mindless psychopaths, and even ghosts and parallel dimensions. My influence as a writer come primarily from the works of Clive Barker, Stephen King, Jack Ketchum, and Blake Crouch in the written form, the beautifully dark, rich lyrics of Mikael Akerfeldt from the band Opeth, and an array of movies, going back to the root of my fascination at a young age with 70's and 80's slasher films such as Halloween, Friday the 13th, and The Texas Chainsaw Massacre.